Pictured: Top; Eric Sichau, Shorebirds Director of Community Relations; Ann DeMarco, PRMC Foundation Board Member; Sherman the Shorebird; Denise Billing, President - PRMC Foundation. Bottom; Joel Olive, Mojo's Co-Owner & Executive Chef; Stacey McMichael, Fundraising Coordinator - PRMC Foundation; Kellie Noonan, Brooke Mulford Foundation Board Member; Rob Mulford, Owner - Market Street Inn & Mojo's, Father of Brooke Mulford; Emilia Chrzaszcz, Manager at Market Street Inn; and Sharrell Callaway, Office Manager - Market Street Inn & Mojo's. 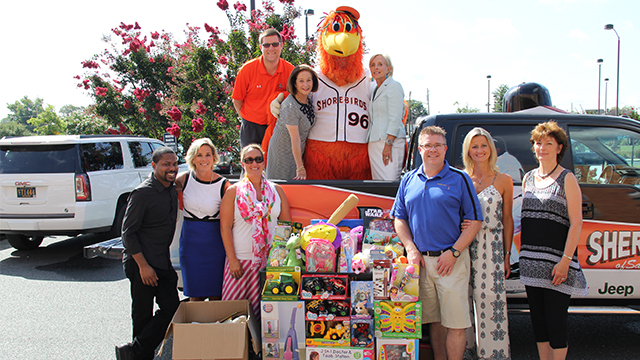 SALISBURY, MD - The Delmarva Shorebirds are proud to announce in conjunction with partners at Market Street Inn, Mojo's, and the Peninsula Regional Medical Center, the results of the Brooke's Toy Closet Toy Drive, held on July 23rd at Arthur W. Perdue Stadium. In total, 151 items were donated by Shorebirds fans, with the Shorebirds presenting the donation to Brooke's Toy Closet at the Peninsula Regional Medical Center recently, along with members from Market Street Inn, Mojo's, and the Peninsula Regional Medical Center Foundation, which oversees and maintains Brooke's Toy Closet. Toy Donations ranged from activity books, to stuffed animals, to interactive toys. All these items will be extremely beneficial to replenishing Brooke's Toy Closet, and very much appreciated from members of the Peninsula Regional Medical Center Foundation and staff from the Emergency Department and Pediatrics Unit. "This was a fantastic partnership with Market Street Inn, Mojo's, PRMC, and the Shorebirds. All parties were extremely excited with the results." said Shorebirds Director of Community Relations Eric Sichau. "We appreciate the support from the local community and Shorebirds fans, and encourage those to donate to the Toy Closet year round to keep it replenished." "We look forward to continuing the Toy Drive during the 2017 Season!" Brooke's Toy Closet was started in 2014 by Brooke Mulford, a local girl who was diagnosed with neuroblastoma, an aggressive form of cancer, in 2009, when she was 4 years old. The closet is a special cabinet filled with toys, coloring books and other goodies that PRMC's Emergency Department and Pediatrics Unit can give to children who are hospitalized. The recipients of these gifts will be able to use them when they're in the hospital, and take them home to enjoy when they are feeling better. For more information on the Peninsula Regional Medical Center Foundation and Brooke's Toy Closet, contact the PRMC Foundation at 410-543-7140. For more information on the Delmarva Shorebirds Community Relations efforts, contact the Shorebirds at 410-219-3112 or visit theshorebirds.com. The Delmarva Shorebirds are the Class "A" Affiliate of the Baltimore Orioles. The Shorebirds are owned by 7th Inning Stretch, LLC, the same company that owns the Stockton Ports of the California League and the Everett AquaSox of the Northwest League. The Shorebirds celebrated their 20th season in 2015, and have entertained nearly five million fans since beginning play at Arthur W. Perdue Stadium in Salisbury, Md. in 1996. The team has captured South Atlantic League titles in 1997 and 2000 while successfully hosting the South Atlantic League All-Star Game in 1999 and 2011.